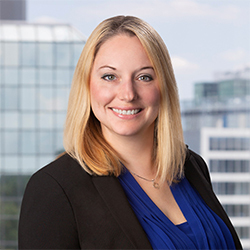 Stephanie Keener joins the firm as a legal assistant for the Real Estate Transactions group in the Arlington office where she will be supporting Mark Goetzman and Antonia Miller. Prior to joining Walsh Colucci, she worked as a paralegal for Rees Broome, where she managed the collections accounts for multiple homeowner and condominium associations, assisted with the preparation of various court documents and filings, and served as a liaison between the association attorneys and homeowners. Stephanie is a graduate of Virginia Commonwealth University where she obtained a Bachelor’s Degree in Criminal Justice with a concentration in Crime Scene Investigation. She also holds an ABA paralegal certification from Marymount University. Outside of work she enjoys rooting for the VCU Rams, reading, and is a devoted Game of Thrones fan. Welcome Stephanie!